We have a busy month ahead as the fall session kicks off! 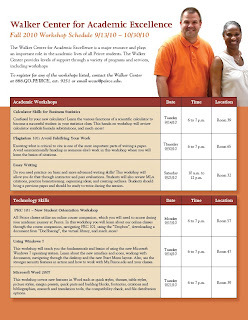 Read on for workshop schedules and other upcoming events that will be hosted by the Walker Center for Academic Excellence from September through November. Get information on our First Year Initiative (FYI) program, financing your education, study skills, support services, navigating PRC 101, ordering textbooks, and more! RSVP by Friday, Aug. 27 by calling 888.GO.PEIRCE, ext. 9219, or visit www.peirce.edu/newstudentorientation. To register for any of the workshops listed below, e-mail the Walker Center or call 888.GO.Peirce, ext. 9251. The following workshops will be offered interactively through Adobe Connect. Instructions for Adobe Connect will be provided upon registration. Promoting Professor and Student Relationships: Tuesday, Sept. 28, 2010 from 6 – 7 p.m. Dealing with Life’s Daily Stresses: Wednesday, Sept. 29, 2010 from 6 – 7 p.m.
Saturday, Oct. 9, 2010 from 10 a.m. – 2 p.m.
As you prepare for exams and final projects, you can benefit from the help of faculty and tutors to assist you with homework, assignments, or test preparation. To register, e-mail the Walker Center or call 888.GO.PEIRCE, ext. 9251, by Friday, Oct. 1, 2010. Thursday, Nov. 18, 2010 from 4:30 – 6:30 p.m. This is a time to give thanks for a great year and a successful new academic year. We invite you to bring and share your favorite Thanksgiving dessert. You do not have to bring a dish, but if you would like to contribute to the dinner, please let us know when you confirm your attendance. During this event, there will be grant orientation meetings. Learn more about your grant program and staff available to support you. Please RSVP to the Walker Center at 888.GO.PEIRCE, ext. 9251, or WCAE@Peirce.edu by Friday, Nov. 5, 2010.